Olympus E-M1X is the latest member of Olympus's OM-D series of cameras. Below you can see the latest models in this series and how their main specs have changed with each new version. Olympus E-M1X has an Overall Score of 84/100 and ranked #22 out of 180 in Mirrorless cameras (Top 10 Mirrorless), and ranked #34 out of 1173 in all Cameras (Top 10 Overall). Now let's get in to more details of our Olympus E-M1X review by analysing its specs and features and listing out its pros and cons compared to average competitor cameras in its class. Olympus E-M1X has a Micro Four Thirds lens mount and currently there are 98 native lenses available for this mount. MFT is the most mature and versatile mount in the Mirrorles camera world. Olympus MFT lenses are known by their high optical quality and affordable prices. Other main contributor of the system, Panasonic also offers similarly well regarded lenses. Third party lens manufacturers also increase number of their offering and new manufacturers also jump in the wagon as the popularity of the system increases. E-M1X also has a Sensor based 5-axis Image Stabilization system which means that all of these lenses will be stabilized when used on E-M1X. 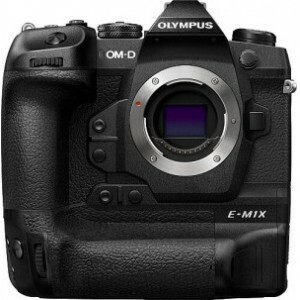 Olympus claims that the image stabilization of E-M1X is effective up to 7.0 stops. Sensor based image stabilization is one of the most useful features that you can have in an ILC. There are also 25 lenses with weather sealing for E-M1X that you can couple with its weather sealed body. Check our Olympus E-M1X Lenses page or use our Smart Lens Finder tool for more detailed lens search. Olympus E-M1X has a 20.0MP Four Thirds (17.4 x 13 mm ) sized CMOS sensor and features Dual TruePic VIII processor. You can shoot at maximum resolution of 5184 x 3888 pixels with aspect ratios of and 4:3. E-M1X has a native ISO range of 200 - 25600 and it can save files in RAW format which gives you a wider room for post processing. Olympus E-M1X is not the highest resolution Four Thirds camera. Panasonic G95 with its 20.3MP sensor is leading in this class. Check the comparison of Olympus E-M1X vs Panasonic G95 or take a look at Highest resolution Mirrorless cameras list. Olympus E-M1X has a special High Resolution mode where the camera takes multiple images of a scene while moving its sensor using the sensor shift image stabilization system and combine them automatically to create a 50.0 MP image. This feature works best with static scenes and using a tripod is a must to minimize stitching artifacts. 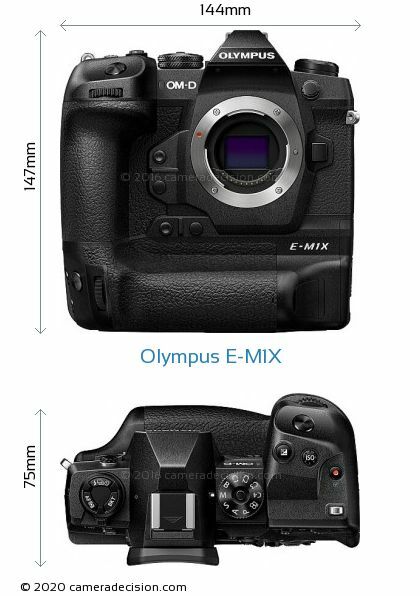 Let's look at how the size of the Olympus E-M1X's Four Thirds sensor compares with other standard sensor sizes. Olympus E-M1X weighs 997 g (2.20 lb / 35.17 oz) and has external dimensions of 144 x 147 x 75 mm (5.67 x 5.79 x 2.95″). Considering that the average weight of Mirrorless type cameras is 417g, Olympus E-M1X is a significantly heavy camera for its class. With a thickness of 75mm, it is not small either, 26mm thicker than the average of its class. 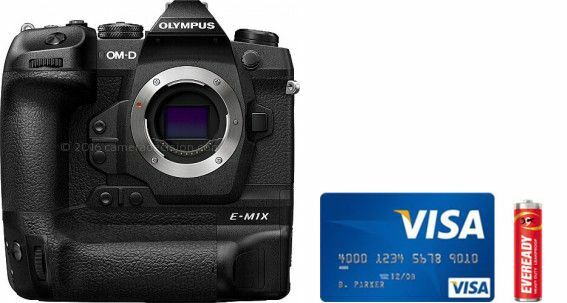 In order to give you a better idea about the real life size of Olympus E-M1X, we have added an image of how it looks next to a credit card and an AA type battery. Olympus E-M1X has environmental sealings on its body which makes it a weather resistant camera. If you like outdoors photography and want to be able to use your camera in extreme conditions, Olympus E-M1X will serve you well. If you attach one of these Olympus E-M1X weather Sealed lenses to E-M1X you will have a great all weather kit. Olympus E-M1X has a Fully Articulated 3 LCD screen with a resolution of 1,037k dots. Both the screen size and the screen resolution is up to the standards of this class. LCD is Touch screen type, so you can change the settings and set the focus point with your fingertips. For those of you who loves shooting self portraits or group photos, Olympus E-M1X will make your life easier with its Selfie friendly screen. E-M1X has a built-in Electronic viewfinder. The viewfinder has a resolution of 2,360kdots and coverage of 100%. 100% coverage ensures that what you see in the viewfinder while shooting matches exactly what you will get later in your image, helping accurate framing your shots and minimizes the need for cropping images later. Olympus E-M1X can shoot continuously at max speed of 60.0 fps and has max shutter speed of 1/8000 sec. E-M1X also has an electronic shutter which can shoot silently at max speed of 1/32000 sec. One thing to keep in mind is that electronic shutter may cause rolling shutter effects on your images in certain conditions. Unfortunately E-M1X doesn't have a built-in flash but it has a flash shoe for mounting external flashes. Olympus E-M1X features both Contrast Detection and Phase Detection autofocus (AF) systems which ensures speed and accuracy of focusing in most situations. The AF system has 121 points to choose from. Olympus E-M1X also features Face detection AF where it intelligently detects the faces in the frame and locks the focus automatically. Macro shooters will love Olympus E-M1X's Focus Stacking feature. In this mode, E-M1X automatically composites multiple shots taken at different focal positions using focus bracketing to create a single image with maximum depth of field. With Olympus E-M1X, you can record your videos at a highest resolution of 4096 x 2160 at 60p, 30p, 25p, 24p fps with bit rates up to 237 mbps and save in MPEG-4 and H.264 formats. This means that Olympus E-M1X provides 4K (Ultra-HD) video, highest resolution that is available in the market today. When viewed on a 4K screen, you will be amazed by the level of details and the crispness. It is also a big step up from its predecessor E-M1 II which has a max video resolution of 4096 x 2160 only. If you are thinking of upgrading your E-M1 II and shoot a lot of video, this is a big factor to consider in favor of E-M1X. E-M1X has a built-in Yes microphone and a Mono speaker. Olympus E-M1X also has a port for an external microphone and a headphone port for connecting external headphones which make Olympus E-M1X a very suitable camera high quality videography. Utilizing its 4K Video recording abilities in a creative way, Olympus E-M1X sports a 4K Photo Mode where you can capture 8 MP photos from 4K videos. Using a software such as Adobe Lightroom on your PC or in-camera function, you can review the 4K video frame by frame and extract the image that you like the most. Olympus E-M1X features built-in wireless (Wi-Fi) connectivity ( 802.11ac + Bluetooth) which lets you transfer your photos directly to compatible devices without any physical connection.Olympus E-M1X's Bluetooth connectivity feature comes handy for connecting other devices that supports it. One other feature that we like is the ability to use our smartphone as a remote to control our E-M1X. You can change camera settings, release shutter, view LCD screen and tranfer files using remote control app. You can connect E-M1X to compatible devices via its HDMI port or Yes (USB-PD allows charging by laptop or external power bank) port. Battery Olympus E-M1X is powered by a proprietary battery which provides a shooting life of 870 according to CIPA standards. Considering that the average battery life of Mirrorless type cameras is 356 shots, Olympus E-M1X has a good battery life for its class. Olympus E-M1X is the longest battery life Pro Mirrorless camera in our database. The closest competitor in this class is Sony A9 with its 650 shots battery life. Check the comparison of Olympus E-M1X vs Sony A9 or take a look at Longest battery life Mirrorless cameras list. What type of Photography is Olympus E-M1X Good for? In this section, we review and score Olympus E-M1X in 5 different photography areas. This first spider web graph shows how the E-M1X compares with the average Mirrorless camera. Olympus E-M1X has a score of 78 for Portrait Photography which makes it a GOOD candidate for this type of photography. If you are looking for a camera that is better suited to Portrait Photography, we recommend you to check our Top 10 Mirrorless Cameras for Portrait Photography list. Olympus E-M1X has a score of 92 for Street Photography which makes it an EXCELLENT candidate for this type of photography. Olympus E-M1X has a score of 90 for Sports Photography which makes it an EXCELLENT candidate for this type of photography. Olympus E-M1X has a score of 65 for Daily Photography which makes it a GOOD candidate for this type of photography. If you are looking for a camera that is better suited to Daily Photography, we recommend you to check our Top 10 Mirrorless Cameras for Daily Photography list. Olympus E-M1X has a score of 59 for Landscape Photography which makes it an AVERAGE candidate for this type of photography. If Landscape is important for you, we recommend you to check our Top Mirrorless Cameras for Landscape Photography list. In this section, we analyse how Olympus E-M1X compares with other Mirrorless cameras within a similar price range. In the Bubble chart below, you can see Overall Score vs Price comparison of E-M1X and the top 10 contenders in the same range. Hover your mouse on the bubbles to see the details of the cameras. Read a more detailed analysis of Olympus E-M1X alternatives. Here is the eight most popular comparisons of Olympus E-M1X amongst Camera Decision readers. It would also be interesting to compare Olympus E-M1X with DSLR Cameras. Below we have listed 4 highest ranked DSLR cameras in Olympus E-M1X's price range. Does the Olympus E-M1X have Image Stabilization? Does the Olympus E-M1X have RAW support? Does the Olympus E-M1X have Weather Sealing? Does the Olympus E-M1X have built-in GPS? What is the Max ISO of Olympus E-M1X? What is the Sensor Size of Olympus E-M1X? 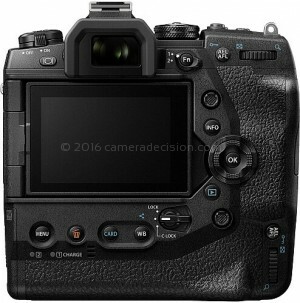 is the Olympus E-M1X a Full Frame (FF) camera? Does the Olympus E-M1X have Touch Screen? Does the Olympus E-M1X have built-in Wireless? What is the Max Continuous Shooting Speed (fps) of Olympus E-M1X?